When you think "Disney Store Exclusive", the first words out of your mouth are probably not "awesome!" "amazing!" or anything like that. Sure, they've been getting better, and their Incredibles exclusive line was noticeably better than the mass market offering, but you just don't think of the Disney Store when you think of highly desirable figures. That is, until now. The new "Disney Heroes" series has arrived at Disney Stores, and the quality of these figures isn't just Disney Store good, it's overall excellent. Remember the Kingdom Hearts toys that came out a while ago? Think those, but bigger, and with some decent articulation. The first series features Peter Pan and Captain Hook from Peter Pan, Prince Phillip and Maleficent's Dragon from Sleeping Beauty, and Hercules from Hercules. I didn't see the dragon, but I'm guessing it could be a larger box set. The focus of this review is Captain James Hook, always near the top of any list of Disney's most nefarious villains. The sculpt on Ol' Hooky is extremely good, not just for a Disney Store product, but by any company's standards. I have a feeling Disney brought in some big guns to handle this line, but I can't prove it. However, the product speaks for itself. 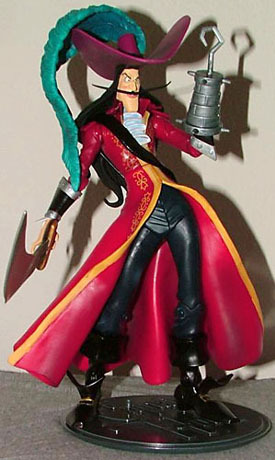 The figure is an excellent 3D translation of the cartoon captain, although his design has been exaggerated and stylized, as is the case with most of the other characters in this line. The feather on his hat, the hat itself, and his sword are all huge. His hook looks like a cruel marriage of cybernetics and medieval armor (think Ash's hand from Army of Darkness), but it all works very well. His expression is appropriately fiendish, and his mustache, which is a separate piece of rubbery material, is particularly nice. 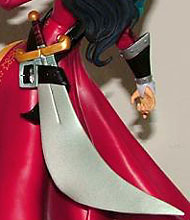 The folds and ruffles in his outfit are detailed without looking too realistic (this is a cartoon figure, after all), and the sculpted pose is appropriately dynamic without inhibiting articulation very much. The paint is also a thing to behold. There is very little bleeding or paint errors of that nature, and this guy is a shining of example of the right way to do a paint wash. The subtlety of the wash is just right everywhere: the hint of maroon in the folds of his red coat tails, the delicate dusting of blue on the black hair...even the face wash is perfect, which might be hard to believe after seeing the red-faced Disney Store-Exclusive Incredibles. Plenty of A-List toy companies could learn from the washes on this figure... this is how it's done. Even the tiny details like the eyes and the design motif on Hook's coat are done extremely well. 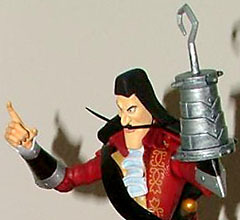 Looking at Hook's dynamic contrapossto pose, you might think he's light on articulation... but you'd be wrong. Hook chimes in with a neck joint, balljointed shoulders, hinged elbows, peg wrists, peg waist, V-crotch hips, hinged knees and hinged ankles. The neck joint is limited due to Hooks flowing locks, and the V-crotch is disappointing, but he's still got more joints than you'd expect. Biceps and boot-tops would be appreciated in this Marvel Legends era, but hey, he's no McStatue! Hook comes with three nicely done accessories: his hat, his sword and his base. As mentioned earlier, the sword and hat are highly stylized, but they look great. The hat sits fine on his head, but it doesn't really lock in place, so any serious movement will cause it to fall of. The sword can fit in Hook's right hand, or it can be slipped into the strategically-folded end of his sash. Clever! The sword and hat are both detailed very nicely with multiple paint apps that are nearly as impressive as those on the figure itself. His base is fairly thin, but solid, and features his name sculpted in appropriate script. The base has two foot pegs, but unless you want him posed awkwardly, it's wise to use one at a time. I cannot stress how good this figure is, or how much it caught me by surprise. 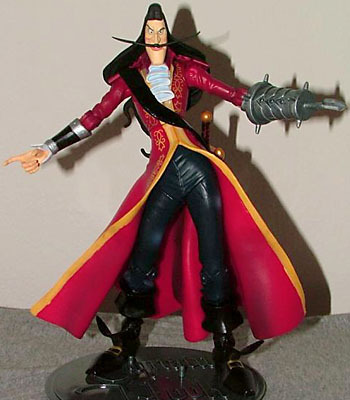 This is the definitive figure of one of Disney's greatest villains, and the other figures don't seem to be any less magnificent. Surprisingly, this figure only cost $9.50, which is chump change for a figure that's almost nine inches tall and features multiple accessories, not to mention some of the best sculpting and painting I've seen on a figure in a while. What Disney heroes (and villains) would you like to see get this treatment? Tell us on our message board, the Loafing Lounge.